I was able to re-flash that calculator. I had symptoms very similar to yours until I fixed the jumper. originally programmed the flash using the JTAG connector. (01-22-2015 08:00 PM)BarryMead Wrote: ... the TX of the Prolific Cable must connect to the RX of the calculator (JP5), and the RX of the Prolific Cable must connect to the TX of the calculator (JP6). Also the GND must connect to the calculator's Negative battery terminal (The top of the battery is Positive), so you want the battery terminal that touches the bottom of the CR2032 coin cell. Yes, that's very helpful. Unless I am mistaken that confirms how I connected it, however, I have not disassembled the calculator and have made no connections other than to the six externally accessible "pogo pin" pads. And, the battery of course. Quote: One of the HP-30B calculators that I modified had a "DEFECTIVE" zero ohm jumper on JP5 or JP6 I don't remember which one it was. Use your ohmmeter to see if both sides of these zero ohm resistors are connected to each other. That's very helpful! I will do that. If either one was broken (defective), flashing attempts using the programming port would obviously fail. I have been putting off disassembly, awaiting $1 worth of 9¢ clock crystals, apparently stuck on the slowest boat to ever depart Shenzhen. However, the interesting thing about that cable is this: the scope picture I posted shows approximately the same signals even if I remove the cable from the calculator. In other words, the signal appearing on the Rx line is there even if I leave it open circuit. Great effort and nice project of yours. - The calculator can power ON, confirmed by an increase in current consumption. - The RX line must be loaded by the calculator output driver circuits, imposing a low impedance on the connection. - So, as you say, it doesn't matter whether the cable is connected or not to the calculator - the result is the same. And why? Most probable cause: The RX connector pin is not making contact with the calculator PCB pad, even if it seems to be making contact. I would check it it a continuity meter. Please share your results with us - Great job! Everything is as you describe. After removing the back cover additional inspection reveals both JP5 and JP6 are intact, and continuity confirmed from both ends of them to J33 and J35, respectively. So much for that, but thank you Barry for your suggestion. So I'm still stuck. I agree verifying the Rx to pad contact is essential, but I have tried physically holding the 1k resistor ends to the pads as well using as the spring pin connector I fabricated. It is not possible to verify continuity while the spring pin connector is attached to the back cover, but it looks and feels intact, and pressing it down with my fingers doesn't make any difference. I'll try it with the cover off but I already know that won't work. Clearly I'm overlooking something obvious. I know from experience the hardware failure I suspect is rare, and the likely cause of this problem lies between my ears. ... and on the 999th time: success! It was Jonathan who put the bug in my ear. The $1.79 cables I bought had their "green" and "white" functions reversed from its $1.79 eBay description. I can't blame Prolific since they don't make cables. Although I followed Jose's schematic, the cable I used is evidently opposite from his (and Jonathan's). My "white" has to go to J35 and "green" to J33. Out of curiosity I swapped Tx and Rx earlier in testing, but other factors probably prevented its success then. Compare the picture of my cable below with dewster's picture from his site. Mine lacks the TxD and RxD printed markings of that one, but the positions are almost certainly identical. The loopback test worked for obvious reasons. Now comes the hard part... duplicating everything I did and documenting it. Thank you everyone! I hereby appoint myself the resident Mac WP-34s flashing expert, but it's everyone else who deserves the credit. (01-23-2015 01:17 AM)John Galt Wrote: ... and on the 999th time: success! Thank you for the information on that Chinese USB-to-TTL-serial adapters variants. I have updated my diagram accordingly, by removing the color schema references. Just for the record, here are some pictures of my cables (a have a bunch of them acquired from two different eBay suppliers) and all of them uses the same color schema. So I wrongly assumed all of the other possible manufacturers were using the same color schema. What was i thinking? P.S. - Edited to remove the extra pictures added initially by mistake. (01-23-2015 08:08 AM)jebem Wrote: I have updated my diagram accordingly, by removing the color schema references. Jose, I don't think there is any need to change your documentation. Bear in mind the cable I received included its own documentation. Its color designations are consistent with your description as well as with everyone else's experience, so I had no reason to question it. The problem is that my cable was built in a manner that conflicted with its own documentation. If I had disassembled the shell to inspect its connections earlier, that problem would have been obvious. Given the potential for uncertainty regarding cables such as these, as well as the question of counterfeit Prolific and FTDI devices, the only suggestion I have for others attempting this procedure would be to verify their device is both authentic and assembled in accordance with its supplied instructions (if any accompanies their cable). There is no guarantee that the USB shell might always be so easily disassembled though, and a simple loopback test is insufficient to identify reversed Tx / Rx conductors. Could you use a diode to identify the proper conductors? (01-23-2015 01:38 PM)John Galt Wrote: There is no guarantee that the USB shell might always be so easily disassembled though, and a simple loopback test is insufficient to identify reversed Tx / Rx conductors. Could you use a diode to identify the proper conductors? Thanks again for your dedication on this project. Really appreciate, as I have learn a couple of things, specially concerning your specific Mac environment. And let's not forget your excellent work on the POGO connector (and thanks to Dave for the additional hints!). Concerning the method to discover the USB-Serial adapter TxD wire, I would just connect both TxD and RxD wires to the GND wire using a 1Kohm resistor on each one. Then I would send a stream of data and use a oscilloscope to read the signal. The wire with a signal is the TxD from the USB adapter. The RxD should not show any significant signal in these conditions. I didn't test it myself, but I can do it during the weekend if needed. Did you mean a LED diode connected between the TXD wire candidate and GND to find out which wire is send a data stream? Now, that seems to be a nice idea! Because the maximum source voltage is 3.3V and a small LED diode takes at least, say, 5mA to light up, we should use a 220R limiting resistor (220 ohm) in series with the LED diode. The only doubt is related to the maximum available current from the TXD drive circuit. 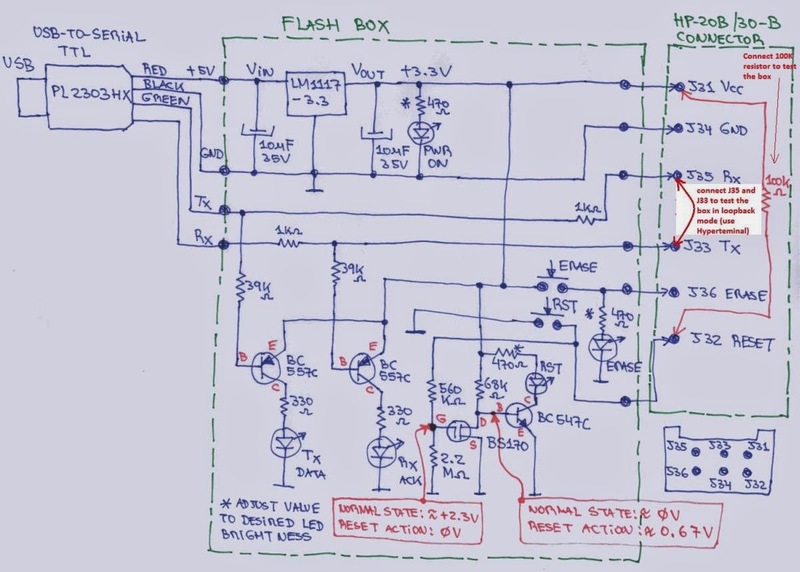 If you look to my schematics, I use a transistor buffer to drive my LED diodes, and in this way I'm not overloading the Prolific driver circuits. But it is worth a try. (11-29-2014 07:13 AM)jebem Wrote: You may like to have a look to my project if you enjoy some diy. Using a USB to RS232 TTL PL2303HX converter is the easier way to get a working flashing cable. I'm sure no one ever dreamed that this project would become so complicated. I'm curious, if this is the "easier way", what's the hard way, or should I be afraid to ask? The slow boat from Shenzhen arrived today, and I installed the crystal and microscopic capacitors, so one more step complete! Don't be afraid. Watch this: http://youtu.be/diJA2cCQenI . It isn't Mac-specific. (01-23-2015 02:39 PM)jebem Wrote: The wire with a signal is the TxD from the USB adapter. Yes, thank you for that. It disturbs me that it took me so long to determine the problem was a reversed Tx / Rx. Despite the fact I have a scope and know how to use it, "something aint right" was my most erudite conclusion! Live and learn. The "eureka" moment was when I noticed the scope showing continuous activity. I had been so accustomed to seeing "Unable to connect" from MySamBa that I completely stopped looking at it. Quote: Did you mean a LED diode connected between the TXD wire candidate and GND to find out which wire is send a data stream? Yes, something like that. I didn't have your circuit connected at the time, but its LED indicators might have helped me identify the problem. I also gave some thought to including an LED to indicate the calculator's power on / off status... but that might be overkill since pressing the ON button definitely turns it on. If in doubt, press ON. It might not be worth the effort. Oh and one more thing... have you ever tried supplying calculator power strictly through the programming pads, in other words, batteries removed? I tried working with it that way and wasn't successful. Pressing a key often caused the calculator to turn off. I surmise the pogo pins I'm using may be inadequate for power. I bought two varieties, both the sharp end and the hemispherical end. I was concerned about excessively scarring the pads with the sharp end, so for testing purposes I'm using the hemispherical end variety at present. The contact area may be sufficient for data, but I suspect it is insufficient for power. Dave, I understand your point and your fine sense of humor . But allow me to justify my options. Easy to build it isn't for sure, if someone expects a step-by-step instruction guide that anyone with minimum skills can just follow and get a working product in the end. But my flash box cable project is documented well enough to allow a skilled person to build their own cable by adding their own ideas. I believe that is the whole concept here. DIY! I needed visual feedback and proper press buttons to make the flashing as practical as possible. 2. What's the hard way? The harder way was to build a cable based on the legacy RS232 serial cable, and then fight to find a serial port on a PC to connect such cable, or even worse, add a USB to RS232 converter, when we have these IC's around that are doing this work for us: Take any common PC USB port, plugin the serial adapter and voila, you have a TTL serial interface ready to connect to your HP-20B/30B! 3. And is there a even easier way? Oh, wait, the only problem is, as far as I can tell, so far nobody was able to offer such a product. I see no need to reinvent the wheel and build your own USB-Serial adapter when Harald's board, like the one Katie used, works just fine. You might need visual feedback, but members have been flashing their calculators for seven years without LED's. I myself bricked two of my calcs when a wire broke and a few of the pogo pins bent and no longer made good contact. The problem was resolved without the need for indicators, and Harald's board has buttons. Good thing I didn't sell you the last of my pogo pins. Regarding "the hard way", that was a rhetorical question. But since you brought it up, realize that there's a "bagfull" of the blue-buttoned RS-232 cables out there and I'm pretty sure most members are using USB adapters with them and not plugging them directly into a serial port on a vintage PC. For the simplest solution, you're half right. A ready-made cable is the way to go. But as far as nobody offering such a product, you're wrong. Harald's board does the trick. Okay, 95% of it. Just solder on a six-pin cable with a plug of you choice and voila, you're up and running. So if you have a USB adapter lying around and you want to save a couple of bucks, sure, go ahead and turn it in to something useful, but to present your solution as the only show in town and not offer alternatives is doing a disservice to the readers of this forum. For the record, here's Harald's original post from 2012 announcing the availability of his USB boards. The version to replace the original HP cable is described at the end of the post and now includes a cable and pushbuttons. Personally, I'd rather spend my limited time on this planet playing with my calculators rather than building USB adapters. So the only thing left is to decide which one to play with, my souped up 71B with a FRAM71 or the recently acquired HP-97. (02-20-2014 05:14 PM)walter b Wrote: ... Harald's boards are the nicest and most useful HW addition to a WP 34S I know. If you know of a source for those cables, please let me know! I made that request in the very first post of this thread. It would certainly have saved me a lot of time! Even knowing its correct name would have helped. I asked for that too. I doubt searching for "blue-buttoned RS-232 cable" would have been worthwhile. Fortunately, with considerable help from others, I assembled my own for < $5, with plenty of parts left over to make even more mistakes than I already have. The end that connects to the programming port was a bit of a pain to fabricate, but it suits my needs. "My needs" were stated in the original post as well - "I know about Harald Pott's USB board, but I'm trying to keep things as simple as possible, without further modifications to the calculator's hardware. " With all appropriate credit to walter b's comment, as useful and convenient as Harald's internally mounted USB board would be, I did not want to add hardware to the WP-35s (other than the RTC of course). PLEASE see Katie's post. This is NOT the board that gets installed inside the 30b. This is a USB-Serial adapter with the appropriate buttons. All you need to do is add the appropriate cable to connect to the 30b. No modifications to the calculator are necessary. Harald has other boards that mount inside that offer IR LED's and LiIon battery charging capability but this isn't one of those. If the HP cables were still available than Harald probably wouldn't have designed these wonderful boards. (01-24-2015 02:44 AM)Dave Frederickson Wrote: SEE KATIE'S ARTICLE. OK, I'll read it again. Thanks! ... you mean this one, linked in my original post? It's brilliant, and that is in fact essentially what I am planning to do - with the addition of status indicators so that I don't have to guess what's going on (as I have been doing). But if there is an interest in these boards I can order some buttons and maybe even make the connectors. From that, it's not clear if he is offering to fabricate the connectors, or complete cables, and as I wrote I already did that. If he's selling completely fabricated end-to-end cables I'd gladly buy one, but I also want the status LEDs for the reasons I described. Perhaps I'm dense -- what am I missing? Yes. That's the article. As I've previously mentioned, perhaps in a another thread, and as you can see from the pictures, Harald has added the USB cable and pushbuttons to the board. You still need to add the cable to connect it to the 30b. After I read Katie's article (If I didn't say it before, thank you Katie) I made my own pogo connector, inspired by Katie's design. Harald and I exchanged a few emails and he was considering including the parts to make the pogo connector as a kit. Since then I sold off kits of parts at cost to recoup my expenses. I think I had to buy 50 pogo pins and I never used the connector strips, but included them in case someone wanted to copy Katie's connector. I think I sold 7 kits of parts leaving me (50-6*7) 8 pins, minus the one that sprang across the room. The pogo connector isn't for everyone. If you only care about flashing the calc once in a while then holding the wires in place works fine unless you're like me. If you only have a single calc and don't mind altering it, then the pin header soldered to the board or Harald's internal board is a consideration. If you flash multiple calcs then think about the pogo connector. The last piece of information I'm going to leave with you is that the discontinuation of the 30b was officially announced at HHC 2014 last fall. So you might like to pick up a couple form ElDoradoTrading while they're still cheap. If history has taught us anything it's HP calculators go up in price after they've been discontinued. (01-24-2015 02:00 AM)Dave Frederickson Wrote: I see no need to reinvent the wheel and build your own USB-Serial adapter when Harald's board, like the one Katie used, works just fine. I'm really sorry to hijack your nice thread, and for misleading you by not telling you about the existing Harald's solutions. I just assumed you were into DIY and suggested my own design. Thanks for your kind remarks and help along the way. You have been very supportive when needed. I totally agree on supporting the WP-34S community, and it includes Harald's solutions of course. Nothing against it. Like many others in this forum, I enjoy DIY and have the required skills, so I decided to create my own design to fulfill my requirements. Because I like to share knowledge with others, I have shared the results here.